Connectors play a key role in fiber optic communications. The finish of a polished connector’s end face determines the quality of its light wave transmission. Consequently, all polished connectors used for communications are required to comply with a strict set of standards and specifications. Some people in the field think the highest levels of performance have been reached, while others believe there is room for improvement. The labor force developed for this field is made up of technicians whose tools have evolved from manual devices into precision machinery. These machines, combined with an experienced work force, are creating the path for global communication. Initially, connector polishing was a manual task performed by a single operator. After a few years of growth the traditional production assembly line was taking hold. Large-scale cable assembly manufacturers (“Jumper Houses”) had dozens of people, each polishing one connector at a time (and, to this day, manual polishing continues to be play a role). Although manual polishing may be practical for some applications, it is very impractical for high volume polishing, or for efficient and repeatable meeting of tight specifications. The alternative, mechanical polishing, is a cost effective method, which produces large volumes of connectors whose levels of performance meet or exceed the industry standards. A machine that uses a specific polishing motion and is tested for conformance to the industry standards will produce quality polished connectors with high levels of consistency from batch to batch. 1. Are the operating functions simple to use? 2. Does the unit offer easy connector interchangeability? 3. Are the polishing platens easy to access? 4. Is there a pressure-setting feature? 5. Does the polishing motion attack the connectors from all sides equally? 6. Can the machine perform angle polishes? 7. Does the manufacturer have the capability to supply custom fixturing if needed? 8. Are the end results meeting and/or exceeding current end-face standards? A quality production polisher will answer “yes” to all of these questions. 1. Timer–a settable timer allows a pre-defined timed sequence of operations techniques to be used. Timing has proven to be critical in obtaining connector performance specifications. A timer should have time settings ranging from 0 to 60 seconds. 2. Pressure setting device–a polishing machine must have adjustable pressure loading capability. Pressure combined with the hardness of the polishing surface will allow the machine to produce the connectors’ required end-face geometry. This device should have a setting tool that has clearly marked divisions of measurement. 3. Inter-changeability of connector holders–connector holders that can be removed quickly and easily offer increased output, less downtime and improved production. A machine that offers connector holders for all connector types adds flexibility to production. 4. Availability of connector holders–In evaluating the equipment, it is important to consider the available connector holders. It is important that the manufacturer has available holders for the standard connectors used around the world–SC, FC, ST–for both PC and APC configurations. Also, the manufacturer should have the capability to provide a range of connector holders beyond the “standards” used–versatility in this area will minimize lost opportunities and maximize the ability to meet potential customer requests. 5. Removable Polishing Platens–polishing platens carry the polishing films that act upon the connector end-face. These should be easily removed and replaced. This minimizes contamination, increases connector output and maximizes polishing film life. 6. Polishing Motion–A key element of a high quality polishing system is the motion of the surface that performs the polishing. If the polishing action is not balanced evenly from all sides, connector performance will suffer and costs will increase because of rejected material and excessively rapid wear of the polishing films. To obtain consistent high quality results, the machine must provide an orbital polishing motion–a circular oscillation. 7. Can the Machine perform Angle Polishes– Though new polishing techniques, such as MPC (Maximum Physical Contact), allow PC finished connectors to achieve APC (Angled Physical Contact) results, the need to perform angle polishing is a must. Angle polishing (typically polished to 8°) is necessary when Backrelection readings of <–65dB are demanded. A polisher should offer the option to polish connectors Flat, with a PC finish, or an APC finish. Different machines should not be purchased for different types of polishes. A quality polisher will have the capability to perform all types of polishing. 8. A ‘Recipe’ for meeting the standards–Standards for today’s connectors are stringent. 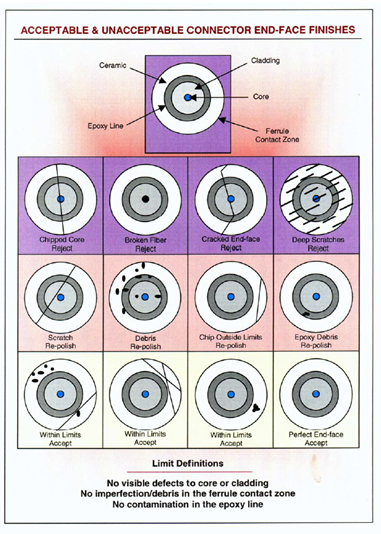 It is important that the machine manufacturer provides, along with a good, preferably illustrated operation manual, specific polishing “recipes” for obtaining the connector specifications (described in the section below)–and, that you have open lines of communication with the manufacturer to keep you up to date in this developing technology. Back reflection is light reflected back through the fiber toward the source, which transmits the light wave. The light reflection occurs at the contact point of two connectors when they are mated. A high level of Back reflection will cause transmission problems for systems that depend on the speed and clarity of a fiber system, since the desired high data rates can encounter bit errors if the signal is distorted. The current industry Back reflection standard is <-55dB. A description of the contacting angled spherical end-face. The angle of choice is 8°. This angle deflects Back reflection to <-65db. A manufacturer of polished cables may see any of these values specified–including the common “in-betweener” of <-50db, but the growing requirement is UPC (<-55db), something heavily influenced by the needs of CATV transmission. Insertion loss is the amount of optical power lost at the interface of two connectors. Poor insertion loss readings are generally a result of fiber misalignment, separation between connections (also referred to as ‘air-gap’) and/or the quality of the finish on the end of the connector. Insertion loss is a function of the polishing equipment and the technique used to perform the polishing. A machine that produces poor end-face geometry will almost always generate unacceptable levels of loss. The currently stated standard for insertion loss is <0.5db, but the commonly expected level, has become <0.3db. In addition to the above performance characteristics, there is a specified product geometry–specified to assure reliability and ongoing proper connector performance under adverse conditions such as vibration and temperature cycling. 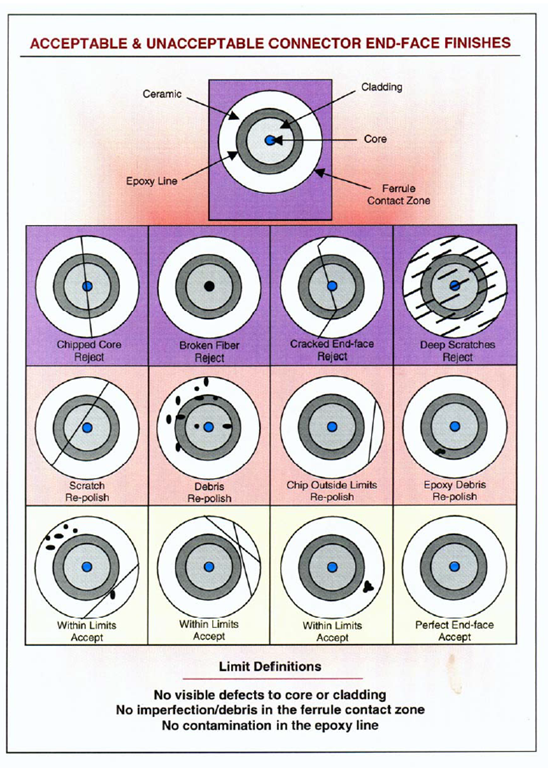 These characteristics depend on the high level of control that a mechanical polisher provides. The term Apex defines the highest point on the spherical surface at the end-face of the connector. Apex Offset is the measured distance between the center of the fiber and the actual high point of a polished connector. Although Apex Offset describes a physical condition of the polished fiber, rather than a performance parameter, it is considered an acceptance criterion in itself. An excessive Apex Offset contributes to high Insertion Loss and high Back reflection readings. Radius of curvature is the measurement of a connector’s end-face spherical condition. The radius generated on a connector end-face affects connector performance, and so is specified– the radius must be such that when mated with another connector most of the compression that occurs is applied to the material that surrounds the fiber (also referred to as ferrule absorption). In general, the ferrules used are pre-radiused. The radius is maintained during polishing by applying pressure between the connector and a resilient polishing surface, by application of a weight or by setting compression dimensionally (it is increasingly rare, but the forming of a flat ended ferrule into a PC end is still done through the same basic technique of applying pressure against a resilient surface). The harder the resilient polishing surface the larger will be the resultant connector radius (more flat). Conversely, the softer the polishing surface the smaller the connector radius. A proper radius, in conjunction with fiber under-cut, allows for correct fiber-to-connector compression. 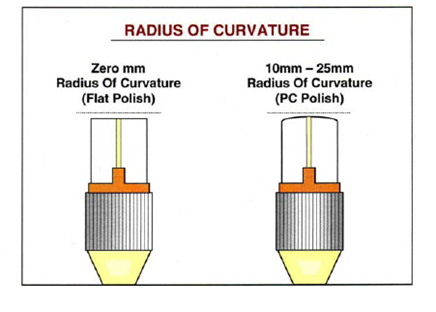 The industry specification for radius of curvature is 10-25mm. This range allows for maximum connector performance. 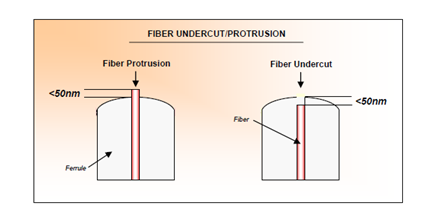 When a fiber is recessed inside a connector ferrule the term used is “Fiber Undercut.” When a fiber protrudes above the ferrule it is called “Fiber Protrusion.” Measurement of this characteristic is accomplished by using an interferometer. An Interferometer displays the offset of the interference lines that pass over the fiber. Most polishing sequences begin with aggressive materials, silicon carbide to remove epoxy and diamond lapping films for the beginning and intermediate polishing, that remove both the ferrule and fiber at the same rate. During the last polishing step, however, a less aggressive material, usually silicon dioxide, is used because it attacks only the fiber. If an aggressive film is used for the final polishing step excessive under-cut will result. have an air-gap. An air-gap will produce unacceptable Back reflection & Insertion Loss measurements. 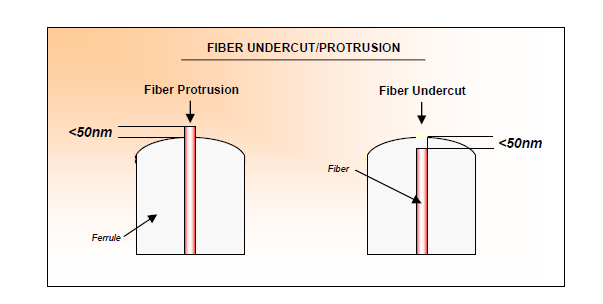 Fiber Protrusion also has a limit–50nm of protrusion being acceptable–Both Undercut and Protrusion, are a result of the polishing process. If excessive protrusion is present, fiber chipping and/or cracking may take place during the connector mating process. For measurement of the performance criteria, Back reflection and Insertion Loss, there are meters available which are generally familiar to polishers. The geometrical criteria, Apex Offset, Radius of Curvature, and Fiber Undercut are confirmed by using an Interferometer. Visual inspection will always play an important role in evaluating the polished surface (see diagram below), but the now increasingly used interferometer is needed to confirm geometry. Interferometers are available from a number of sources, ranging from those which provide a monitor from which the user determines product acceptability, to computer aided programs that provide a printed readout which includes all performance and geometric characteristics of the connector.